Of all the Penang hawker food, I am a big fan of Penang Hokkien Mee. There are many excellent Hokkien Mee places in Penang. Today, I would like to introduce you to Bridge Street Hokkien Mee. 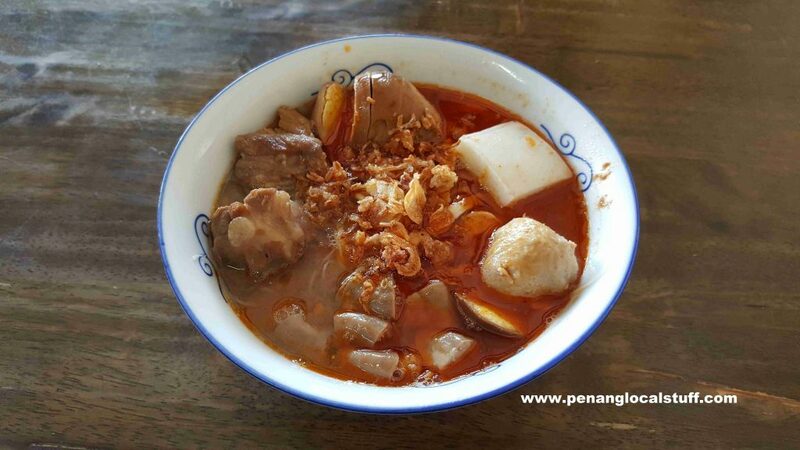 The locals call the place “Kio Thau Hokkien Mee”, with “Kio Thau” literally translated to “head of bridge” – because it is located beside the Anson Bridge, which connects Beach Street to C.Y. Choy Road. You may ask: Where is Bridge Street? Well, Bridge Street is actually the old name of C.Y. Choy Road. So, this Bridge Street Hokkien Mee shop obviously has quite a long history. 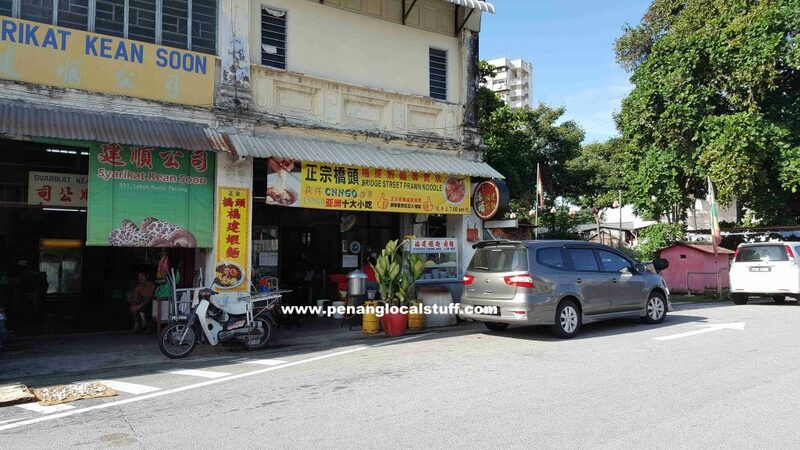 The shop has a big banner at the front, saying that the Bridge Street Hokkien Mee is featured in the CNNgo website (a travel webpage owned by CNN). Well, my first thought was whether a US-based website can provide an accurate review of Penang Hokkien Mee. It is a small shop, and sells both Hokkien Mee and Lor Mee. I ordered a big bowl of Hokkien Mee, and requested for all the add-ons (meat balls, fish balls, egg, pork ribs, and pig intestines), considering I want to try the best combination. On hindsight, I should have opted for a normal bowl, to get the original taste of Hokkien Mee. The Bridge Street Hokkien Mee has an aromatic pork-based soup, and it is quite tasty. Each table has the Hokkien Mee chili sauce, which you can add per your liking. Overall, I would say that the Bridge Street Hokkien Mee is pretty good. You should definitely try it out if you are a Penang Hokkien Mee fan. The only drawback is that the shop is small, and may be slightly uncomfortable.